President should take charge in the legislation of a special bill on Sewol Ferry Tragedy that she promised. 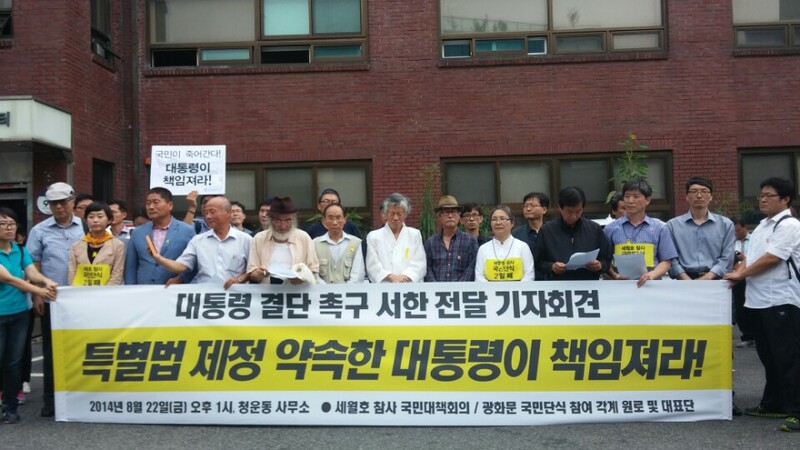 At 1pm today (22 Aug) in front of Cheongun-dong Community Center, the People’s Committee for the Sewol Ferry Tragedy and respected elders and delegations from various sectors of the society, who have joined the national movement of fasting, held a press conference demanding that President Park Geun-hye deliver on her promise of legislating the “Special Sewol Law” and make a prompt move towards the law’s enactment, and delivered a letter containing the request to the presidential office. Present at the press conference were representatives from the People’s Committee and Professor Cho-ha Ryu of Professors for Democracy; Reverend Seung-ryeol Park, Chairman of the National Clergy Conference for Justice and Peace; Reverend Tae-hyo Jeong, Co-president of the Christian Movement for Democracy; Mr. Sang-jin Lee, Vice President of the Korean Confederation of Trade Union; and Reverent Master Han-ung Yang, Labor Committee Chairman of Jogye Order of Korean Buddism, who are also fasting in support of the Sewol families. President should take responsibility in the matter of enacting the promised special law. Today marks 129th day since the tragic sinking of the Sewol ferry. 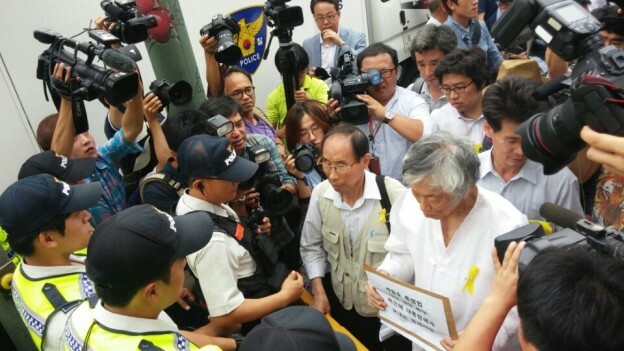 It has been 40 days since Mr. Young-oh Kim, father of the late Yoo-min Kim, started his hunger strike. Ten missing victims still haven’t found their way to their families. This morning Yoo-min’s father, whose health conditions had been in rapid deterioration, had to be sent to a hospital and we cannot afford to lose any more time explaining our request in great detail to the President. Our simple and to-the-point demand is that President Park Geun-hye ought to keep her promise that was made on May 16th when she met with the families of the Sewol ferry victims. On that occasion, she said that “the first and foremost is to ensure that the family members don’t have any misgivings about the investigation.” The Korean people still haven’t forgotten that promise. During the visit of Pope Francis, who is respected throughout the world, the families of victims were able to meet him every single day. The Pope listened to the words of the Sewol families wherever he was and soothed our wounded hearts. President Park herself thanked the Pope for consoling and praying for the Sewol ferry victims and their families. Then why is she not able to console the families herself by showing determined actions, by agreeing to meet with the families, and by delivering on her promise to enact a special law that reflects the terms of the families? Presidential spokesperson Kyung-wook Min recently even stated that “the special law on Sewol needs to be worked out between the ruling and opposition parties” and “it is not a matter the President should weigh in on.” The Korean people are indignant to the President’s irresponsible response to the families of victims who are risking their lives to ensure a thorough investigation of the incident. A thorough and independent investigation—that’s the only thing the families of victims want. With a firm belief that legislating a special law that includes guaranteed rights to investigate and prosecute would uncover the truth, the families of the Sewol ferry victims traveled around the nation to collect millions of petition signatures without having a moment to truly ponder upon the absence of their precious children. They walked 40 kilometers calling for a thorough investigation and making a safer society, and are still staging a rally in front of the National Assembly and on the streets. In Gwanghwamun Square, a father, who has been fasting for 40 days and painfully making his way to meet the President because he “feels sorry for not having protected his daughter,” is continuing the hunger strike with his life on the line. Until when is the President going to turn a blind eye to the pains of the people? As the President is well aware of, the ruling and opposition parties shamelessly stroke a deal on a special bill that does not include the families’ terms. Now it is time for the President to make up her mind. The President ought to grant the desperate wish of the families by acting on the promise that she made. Thousands of the Korean people are convening in Gwanghwamun Square in concern for the prolonged fasting of Yoo-min’s father and having a relay fasting to call for the legislation of a special law that includes investigative and prosecuting powers. The eyes of the Korean people are now on the choice and decision the President will make. The President should not ignore this matter any longer. President Park must make a decision to enact a special law that allows a thorough investigation. If the promise she made to the families of the Sewol ferry victims and the Korean people was not just empty words, the President should make a decision. We hereby make an unequivocal statement to the President that the final moment is approaching. The President needs to clearly realize that it will be not long before the 50 million Korean people march to the presidential office to meet her. This is our final warning. English | tag: letter, president, sewol | 2014/08/22 by english.